Leah Hogsten | The Salt Lake Tribune Utah Jazz center Rudy Gobert (27) enters the court as the Utah Jazz take on the Atlanta Hawks, Feb. 1, 2019 at Vivint Smart Home Arena. Rudy Gobert snatched a pass out of the air, moving toward the basket, the ball in his left hand, a massive defender crowding him from the right side. He couldn’t quite get to the rim, even with the advantage of an intercontinental extension, for a dunk, which was the beauty of the whole thing. Instead, he boosted toward the corner of the glass, after gathering his feet, kneecaps, hips, allowing them to catch up with his reach, powering through the human barricade with his lower body, his right shoulder absorbing contact. He flipped a shot up, spinning it just so, kissing it off the window and into the hoop. That sequence, hardly a spectacular movement by NBA standards, nor particularly sophisticated, signified much more than two points in a recent regular-season game, something much more valuable. It evidenced … advancement. 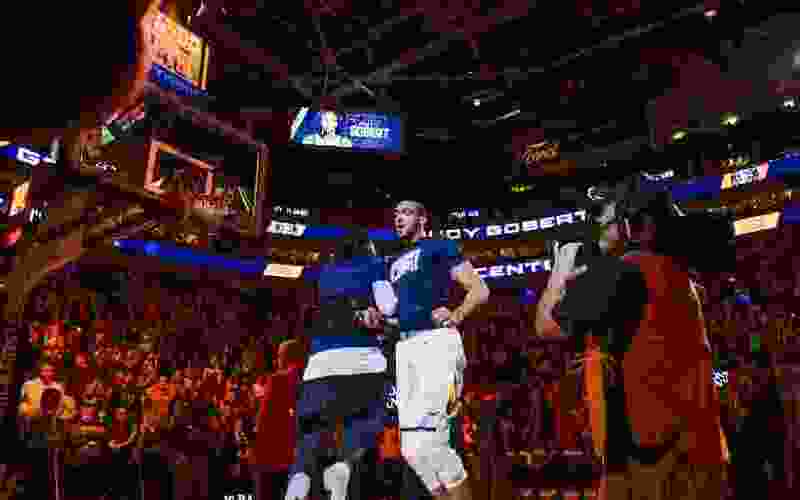 Here’s a stone-cold fact that should scare the bejeebers out of Western Conference foes as the playoffs near, and into the future: Gobert is getting better. He’s doing things he could not do just two years ago, one year ago, four months ago. Especially on attack, but also at the defensive end. “Rudy’s expanding his game,” pronounces Quin Snyder. Stretching that already sweeping 7-foot-forever reach. Yes, Gobert was the NBA’s defensive player of the year last season, adversely affecting opponents’ shots in and around the paint, causing them second-thoughts about even putting up routine attempts down deep, anchoring the Jazz’s resistance. Now, stronger and better conditioned, seemingly better coordinated, he’s covering more ground, bothering jump-shooting bigs, returning back to help teammates who’ve been beaten off the bounce, roaming around like Inspector Gadget on patrol, having improved two weaknesses that formerly vexed him — a lack of anticipation and of lateral quickness. “I have worked hard to make myself better,” Gobert says. The increased awareness Gobert has shown on defense, gaining a broader sense of where every opponent is, has come in part from his years in the NBA, but also from listening to instruction from Jazz assistant coach Alex Jensen. When the best defender in the league pushes to become a better best defender, that is notable. On occasion, Gobert still gets beat. An opposing center skies a shot over him, or he leaves his man to stop the drive of a guard who has blown by a teammate’s porous perimeter defense, which happens enough to cause some concerns for the Jazz moving forward, and that guard drops a pass to Gobert’s original assignment and that player scores. It happens. Gobert cannot cover everybody everywhere. But as the rings around the trunk have increased, he has improved his read-and-recognition skills, along with the physical gains to better take advantage of the knowledge he has acquired. On offense, Gobert’s contributions begin with the subtle stuff. Snyder compares him to a prized left tackle who protects the quarterback, without whose abilities an entire passing attack would collapse. The unselfishness is manifested in Gobert’s passing, his screen assists, his picking-and-rolling that draws teammates’ defenders to him, opening them for good looks or allowing them to get to the rim, the physical beating he absorbs in achieving all of that. And there are times when the offense opens up for Gobert. As a kind of symbolic gesture, Snyder spent the opening minutes of training camp on lobbing passes from perimeter players to Gobert, over and over. His teammates got the message that their coach wanted a two-pronged emphasis at the offensive end — accurate airmails into a rolling Gobert and 3-point shooting. The two are tied together, seeing that off the Jazz’s actions, defenders often are faced with a decision — committing resources to interfere with Gobert’s incessant rolls to the basket — or scrambling to defend the corner 3. Gobert leads the NBA in dunks this season, and much has been made of that. Much should be made of it. He also leads the league in shooting percentage, scoring at a .670 clip. And he’s averaging 15.7 points, a significant jump from past seasons. His career scoring average is 11.1 points. And the Jazz are attempting and making considerably more deep balls than ever before, particularly from the corner. As Snyder suggests, Gobert is the key to making that happen. Gobert has quietly spent hours working on his positioning and touch around the basket. His post-up moves remind no one of Hakeem Olajuwon, but nobody cringes anymore when he receives bounce passes down low. It’s in the center’s plans to continue that growth in the months and years ahead. Catching and hammering the alley-oops indeed have already been mastered. His passing out of the post has become more precise. His free-throw shooting more reliable. The more he’s been featured in the attack, the more he’s been motivated to expand and show his abilities. “I always want to be aggressive,” Gobert says. He’s fully aware that his dimensions give him an advantage, what was and is needed was and is a refining of skills. And that refinement is under way, to the point now where Snyder recently said Gobert’s contributions on offense are equal to his contributions on defense. Gobert has made a liar of anyone who said in the past that that would never be the case. Which is to say, he’s made a liar of everyone.